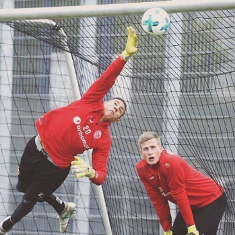 German-born Nigerian goalkeeper Maduka Okoye could be missing from Fortuna Düsseldorf U19s line-up when they face table toppers Schalke 04 in the A-Junior Bundesliga on Sunday, February 18.Fortuna Düsseldorf U19s are facing a goalkeeper crisis ahead of the visit of Schalke 04, with Mario Zelic injuring his ankle during the warm-up before the match with Arminia Klosterhard. Okoye is struggling to overcome a knee complaint and has to undergo a late fitness test before he gets the green light to be in goal against Schalke 04. Fortuna Düsseldorf in the A-Junioren Bundesliga West and Regionalliga West, and has posted four shutouts. Super Eagles manager Gernot Rohr is monitoring the performance of Okoye in Germany and could hand him a maiden call-up to the national team ahead of the 2018 World Cup. Nigeria Football Federation scout Victor Agali held clear-the-air talks with Okoye over playing for the Super Eagles in November.